Bold claims you might say, but when you see the results you’ll understand why! 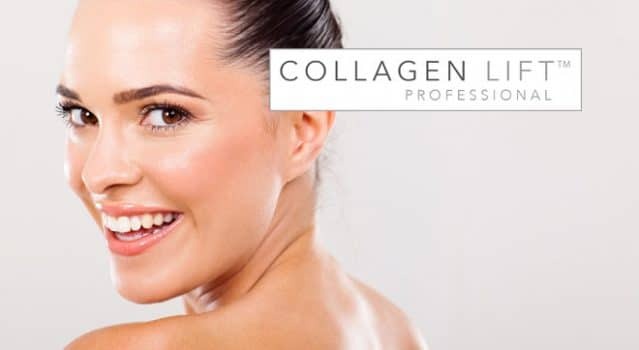 A course of Collagen Lift treatments can help you to reduce fine lines, wrinkles and jowls, improve the appearance of cellulite, stretch marks and scars, and can also help to lift and tone the skin on both the face and body. Here is a fantastic before-and-after photo to show you the kind of results you can get with Collagen Lift. Intrigued? Read on to find out how it works! How does it achieve such fantastic results? Collagen Lift works by using a handpiece to deliver energy waves deep into the skin. These energy waves, also known as radio frequency waves, stimulate several of your body’s natural processes, to effectively remodel your skin. The first change you notice after Collagen Lift is that your skin is tighter – the energy waves realign elastin fibres in your skin, which instantly improves structure and tautness. Then, Collagen Lift stimulates your skin’s collagen production, which plumps, smoothes and firms your skin. Collagen is a vital component of your skin, but as we age, we have less and less of it. By increasing collagen levels, your skin becomes visibly younger looking. Collagen Lift treatments also help to boost cell metabolism, which provides a temporary reduction of fat cells. Combined with exercise and a healthy lifestyle, this can help you reach your fat loss goals too! Amazingly these results can be seen instantly, and last for up to two years, all without any invasive surgical treatments or injections! It’s a painless and relaxing treatment (many clients describe it as being similar to a hot stone massage) and there’s no recovery or downtime afterwards. Collagen Lift really is the best of both worlds – extremely effective and convenient. Collagen Lift is currently rolling out across the country. You can find your nearest therapist here, simply select ‘Collagen Lift’ from the dropdown.